"I appreciate Taylor Swift for supporting not only my music but just the hip-hop culture," he said. Recording artist Kendrick Lamar performs onstage during 2014 ONE Musicfest at Aaron's Amphitheater at Lakewood on September 13, 2014 in Atlanta, Georgia. 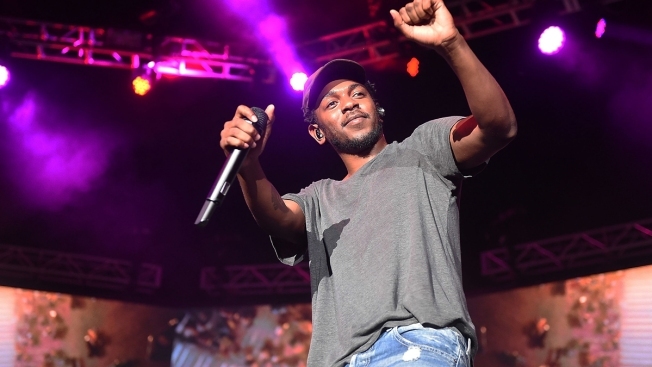 Kendrick Lamar appreciated Taylor Swift for paying homage to his music in a recent interview. Lamar was grateful to hear about Swift knowing the words to his lyrics and putting her in a great mood. The rapper praised the country music star for speaking highly of his music, saying her admiring remarks show hip-hop shouldn't be categorized for one listener. "Some people always try to lock it down and categorize it for one particular listener," Lamar said at the fifth annual ONE Musicfest in Atlanta on Saturday night. "But it moves all, even people from other genres." In a recent interview with Rolling Stone, Swift said listening to Lamar's music helps change her mood from feeling "victimized" to "awesome." She said her "go-to" song is Lamar's "Backseat Freestyle," a record featured on his Grammy-nominated album, "Good Kid, M.A.A.D City." "I appreciate Taylor Swift for supporting not only my music but just the hip-hop culture," he said. "There's really no gap. It's music and it feels good." Lamar spoke backstage with The Associated Press after his 90-minute performance at the Aaron's Amphitheatre at Lakewood. He was one of the headliners with rapper Nas of the one-day festival, which also featured Jhene Aiko, Method Man & Redman and Bilal. During his set, Lamar often squatted with the microphone in his right hand, thanking fans for helping his rise to fame. The Los Angeles-based rapper spoke about when he used to visit Atlanta to perform in front of small crowds. Lamar didn't perform any new songs. But it didn't seem to matter to many in attendance, who recited the lyrics from several of his hit songs from "Swimming Pools (Drank)" to "Poetic Justice." "I remember when I used to perform in front of 200 people," Lamar told several thousand attendees. "Now, it's a sea of people. I'm glad to see the growth here. It speaks volumes about the hip-hop culture."